Melissa Blackledge is an International Trade Specialist at the International Trade Administration’s Export Assistance Center in Cleveland, Ohio. We’ve all heard sad stories like this: an American manufacturing company that has been around for decades closes because it can’t compete in today’s complex, global marketplace. It’s an unfortunate reality experienced by many local communities. However, a recent announcement from Cleveland-based Great Lakes Towing Company suggests its fate will be more favorable. Great Lakes Towing Company will deliver a tugboat like this in early 2016 to the Port of Quetzal in Guatemala, marking the 116 year-old company’s latest expansion into Central America. The sale was supported by U.S. & Foreign Commercial Service staff in Cleveland and at the U.S. Embassy in Guatemala. Recently, the 116-year-old company began construction on a tugboat destined for delivery in Puerto Quetzal, Guatemala, marking the company’s latest expansion into a Central American market. At the tugboat’s ceremonial “*keel laying”, local leaders gathered to celebrate Great Lakes’ ability to compete globally and highlighted the company’s role as a creator of highly paid manufacturing jobs in Northern Ohio. *In ship-building, the keel laying marks the first stage of the joining together of a boat to officially mark its construction. Once completed, this tugboat will have quite the story to tell. The deal between Great Lakes Towing Company and Regimen de Pensiones y Jubilaciones del Personal de la Empresa Portuaria took several years to complete and saw contributions from U.S. Commercial Service trade experts in the U.S. Embassy in Guatemala, as well as within the United States. Many manufacturing industries, competition in the ship-building business is fierce. Great Lakes Towing’s success in Guatemala is another sign that demonstrates that American workers and products are desirable – and that American companies can win in today’s worldwide, economic stage. It can take a team for small- or medium-sized businesses to successfully export – Businesses with Made-in-America products or services have this team readily available within the U.S. Commercial Service. In the case of Great Lakes Towing, they worked with trade specialists at the U.S. Embassy in Guatemala to better understand the market and ensure a transparent negotiations process. 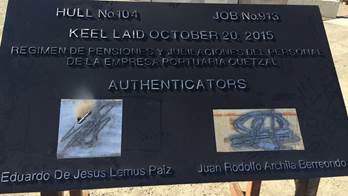 Upon starting the tugboat’s construction, the buyers welded their signature to pieces that will be attached to the hull of the new boat. 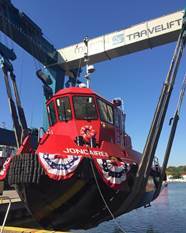 The feel good story of the Great Lakes Towing company doesn’t have to end once they deliver the new tugboat. Companies who manufacture Made-in-America products can model their own success after Great Lakes’. The first step is to reach out to the team that’s ready to help American businesses compete in today’s global marketplace at the U.S. Commercial Service. With offices in U.S. Embassies around the globe, and 109 cities across the U.S., the U.S. Commercial Service can craft an export strategy tailored to your industry. If your business is thinking about expanding into international markets, or if you’re looking to elevate your current export strategy to the next level, contact the U.S. Commercial Service trade experts in your state. They are happy to help your team create its own exporting success story. This is a guest blog by Maurice Jones, Secretary of Commerce and Trade for the Commonwealth of Virginia. The Commonwealth of Virginia was founded as a business venture more than 400 years ago by the Virginia Company of London, a joint-stock company formed both to bring profits to its shareholders and establish an English colony in the New World. Since its founding, the Commonwealth has remained a journey of economic opportunity, a great place to launch new businesses and grow existing ones. About 80 percent of the world’s purchasing power resides outside of America. Thus, helping Virginia businesses sell their goods and services abroad is one of Virginia’s most effective business expansion strategies. In 2014, Virginia exported goods and services valued at more than $36 billion, including $15.1 billion in manufactured goods, $16.9 billion in services, $3 billion in agriculture products, and more than $1 billion in mineral fuels. These exports went to 212 destinations throughout the world. Virginia company exports support over 250,000 jobs in Virginia. Ten years ago, in the mountains of Rocky Gap, Virginia, American Mine Research (AMR) decided it was time to reinvigorate its international sales efforts. AMR provides monitoring and control products for the mining industry, and the company recognized the opportunity for its products to be sold around the world. AMR contacted the Virginia Economic Development Partnership (VEDP), which provides export assistance to companies across Virginia. With VEDP’s assistance, AMR established distributorships in Mexico, Canada, Brazil, Chile, and Peru. Thanks to AMR’s commitment to growing international sales and Virginia’s export assistance programs, the company is growing from every angle. Building on the success stories of hundreds of Virginia exporters like AMR, Governor McAuliffe announced in July 2015 the creation of a new initiative to increase international trade in Virginia. The Virginia International Trade Alliance (VITAL) expands Virginia’s nationally recognized international trade program through formal partnerships with Virginia’s industry associations and public universities to serve their member companies as they expand international sales. During its first five years, VITAL seeks to grow Virginia exports by $1.6 billion and create 14,000 trade-supported jobs. By exponentially accelerating Virginia companies’ engagement with the global economy, VITAL will create stronger, more resilient businesses and more jobs for Virginians. The VITAL initiative demonstrates the Commonwealth’s commitment to helping existing Virginia businesses succeed in the international marketplace, which makes our economy even stronger. The Governor has made the program a priority and reallocated $1 million toward the initiative through flexibility granted to him in the state budget. VITAL is managed by VEDP and comprised of 13 partner organizations, including industry associations and public universities. VITAL will build upon Virginia’s proven export assistance programs, including tailored market research, face-to-face meetings with qualified partners overseas, and VEDP’s award-winning Virginia Leaders in Export Trade (VALET) Program. For more information, visit www.ExportVirginia.org. Secretary Penny Pritzker swears in new commercial officers. U.S. Commerce Secretary Penny Pritzker today swore in 24 new Foreign Commercial Service Officers and one Intellectual Property Attachè at the Commerce Department. The ceremony marked an exciting beginning to these officers’ careers in overseas and domestic markets where they will work to strengthen the American economy by supporting U.S. businesses in the global marketplace. 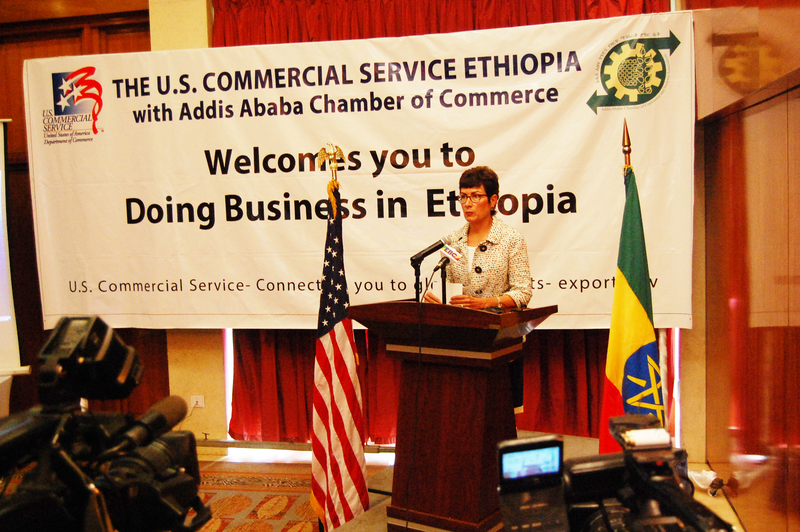 The administration is committed to increasing U.S. exports, which support millions of jobs. U.S. exports have set records for four consecutive years, reaching $2.3 trillion in 2013. These exports now support 11.3 million jobs in the United States. The recent launch of the NEI/NEXT campaign by Secretary Pritzker has built on the momentum of the recent growth to encourage American companies to take their business to overseas markets. Expanding trade and investment is a central part of the Department’s ‘Open for Business Agenda’ and having an overseas presence is one critical way to support U.S. businesses seeking to grow in foreign markets. During a recent trip to Burma, Secretary Pritzker announced the Department of Commerce will expand its overseas resources to help U.S. businesses navigate additional global markets and sell their goods and services to customers all over the world. The Department’s International Trade Administration will add a total of 68 new positions and open offices in five new countries, including its first in Burma. The expansion is largely focused on fast-growing markets in Asia and sub-Saharan Africa. The Department of Commerce will soon add new offices in Africa and Asia in order to facilitate exports in these critical markets. The new officers bring a wealth of knowledge and experience from their prior private or public sector service. Of the more than 3,800 candidates, these 25 men and women were chosen because of their constant resourcefulness, tenacity, and of course, diplomacy. These new Commercial Service Officers play a vital role in the enhancement of American businesses. They support U.S. businesses in overcoming trade barriers, finding global business opportunities and partners, and attracting investment to U.S. shores. These officers will be the boots on the ground, leading the charge to open new markets and helping companies compete in the global marketplace. SelectUSA: Enhanced, Engaged… and in Japan! Andrew Wylegala is the Minister Counselor for Commercial Affairs at the Embassy of the United States in Japan. From left: SelectUSA Executive Director Vinai Thummalapally, Japan Minister of State for Economic and Fiscal Policy Akira Amari, and Ambassador Caroline Kennedy at the Investment Showcase in Tokyo. View more photos on the ITA Facebook page. Japan is the second largest source of foreign direct investment (FDI) into the United States, with a total stock valued at $309.4 billion as of the end of 2012. According to our partners at the Japan External Trade Organization (JETRO), Japan registered its second-highest ever outbound investment level in 2012 at $122 billion, and Japanese investors chose to send 26 percent of that to American shores. FDI isn’t just about capital: In 2011 more than 686,600 U.S. workers were employed by the U.S. subsidiaries of Japanese companies with an average wage of $78,356. It’s clear that our investment relationship with Japan is a key contributor to the U.S. economy. That’s why our SelectUSA team and Commercial Service personnel in Japan joined U.S. Ambassador Caroline Kennedy to host an investment showcase in Tokyo. Japan’s Minister of State for Economic & Fiscal Policy Akira Amari and Ambassador Kennedy stressed at the investment showcase that few aspects of the broad United States-Japan partnership are more mutually beneficial than investment. Dynamism was the first key concept. Japan has resumed its role as a powerhouse in cross-border direct investment. Japanese investors also continue to believe in the opportunities offered by the U.S. market. For example, in 2012-13, Toyota, Nissan, and Honda expanded already sizable U.S. manufacturing footprints, contributing to the renaissance in American manufacturing. So what’s new? A wave of investment is under way, embracing sectors from cellular communications to carbon fiber; improved tomato seeds to Kentucky bourbon; economy hotels to the limits of the Japanese and American imagination! A testament to the success of this investment showcase is Leslie Ken Yamada, president of Japan’s Sanikleen. He spoke about his company bringing its business model to Hawaii, having made important connections in the Hawaiian market with the help of the SelectUSA team. Osaka-based Daiwa House and Dallas-headquartered Lincoln Property Company signed a memorandum of understanding to develop $1.5 billion worth of multi-family homes during the next three years, beginning with a joint project in Ft. Worth. Mutuality was the second theme as Minister Amari and others stressed that the benefits of cross-border direct investment are multi-directional, flowing well beyond the country of investment, in the form of access to new markets and the generation of ideas that bubble up when individuals from diverse backgrounds work side-by-side. For example, Olympus Surgical Technologies broke ground in December for a $37 million facility in Brooklyn Park, Minn. As an R&D, design, and manufacturing operation, the improvements in non-invasive surgery that engineers from both countries will develop in Minnesota will benefit patients worldwide. We’ll continue to work closely with our friends in Japan to promote and facilitate investment. Thanks to the Association of American State Offices, JETRO, the Japan Chamber of Commerce and Industry, the American Chamber of Commerce in Japan, and the Japanese government for contributing so much to our continued partnership. If you’re a U.S. economic development organization aiming to attract increased FDI from Japan, please contact SelectUSA. We’re organizing a Road Show, May 19-23, in Tokyo, Nagoya, and Osaka, and we’d love to have you join! Last year it sold out, so get in touch soon! Posted in SelectUSA | Tagged Commercial Service, FDI, Investment Showcase, Japan, SelectUSA | Comments Off on SelectUSA: Enhanced, Engaged… and in Japan!